On a clear night, you can see many stars. You may wonder how many stars are there in the universe and surely won’t spend the entire evening counting stars. Well, astronomers think there are large number of stars and guess (estimate) that there are around 1 septillion stars in the Universe1. If you look at the night sky, you can see around 3,000 stars with the naked eye. A galaxy is a group of hundreds of billions of stars that are relatively close to each other. Our galaxy, the Milky Way, contains over 100 billion stars. 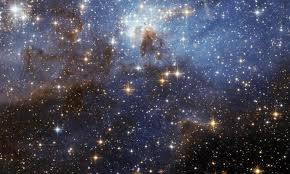 The universe has more than 100 billion galaxies with each galaxy containing an average of 100 billion stars. Well, you can just imagine the number of stars in the entire universe. Promixa Centauri is the closest star to Earth. It is located 4.2 light years away. This means that the light from the star takes 4 years to complete its journey to Earth. If you travel to Promixa Centauri on a fastest spacecraft, it will still take you thousands of years, probably over 50,000 years to reach its surface. The most massive stars can be as much as 2 billion miles across (our Sun is only 860,000 miles across). If one such massive star were in the solar system, it would gobble up 6 planets, including our Earth. Stars have their own gravity fields, which keep them close to each other. The best example is the globular cluster, which contains millions of stars tightly held by gravity. In the Milky Way galaxy, there are 147 globular clusters identified by astronomers. The Crab Nebula is the remains of a supernova, which occurred in 1050 A.D.
Just like human beings and animals, stars have their own life cycles. They pass through many phases and die. About 90 percent of their lives are spent fusing hydrogen to produce helium. Stars explode when they die. This event is called a supernova. However, very small percentages of stars explode. Most stars end their lives in different ways, some cool down to become white dwarfs and eventually fade into space and become black dwarfs. Stars come in different sizes. Some are smaller than our Sun whereas others are so huge that our sun is a mere dot when compared with their size. Some stars, called supergiants have a radius of about a thousand times that of our sun. The smallest stars are called neutron stars. Some neutron stars are so small that their radius is only 10 kilometers (6 miles), which is almost equal to the drives within Manhattan’s Central Park that are used for jogging and bicycling during weekends. The poetry “twinkle twinkle little star” must have been inspired by those beautiful stars twinkling in the night sky. But have you ever wondered why stars twinkle at night? The twinkling of stars is actually caused by the movement of Earth’s atmosphere. The light emitted by the star enters the atmosphere in a straight path, but we see stars twinkling because air movements in our atmosphere change the paths constantly, hence the twinkling. In ancient times, people observed that certain stars are arranged in patterns resembling animals, common objects or human beings. These patterns, called constellations, also had patterns representing Greek and Roman mythological characters. Example of a Planetary Nebula - The Helix Hebula Today, the constellations are used by astronomers for mapping stars. There are 88 constellations recognized by the International Astronomical Union (IAU). When an average-sized star dies, it sheds its outer layers, which causes the formation of planetary nebula. The Cat’s Eye Nebula is the best example of a planetary nebula.